A&A are 2 years old now. They are at a stage when they want to do everything on their own. Be it climbing the steep stairs of the garden alone or running on the road without being held. They want to explore their surroundings and experience everything firsthand. As a mother I find myself often struggling between this constant urge of ‘letting go’ to raise independent kids and ‘holding on’ to keep them safe. And I think this struggle is real for all the parents. I want my kids to learn and grow on their own but at the same time I don’t want them to get hurt. I fear their safety and want them to be protected always. Finding this balance between giving freedom to kids yet protecting them enough is one of the toughest parts of parenting. Wouldn’t you agree? Sometimes in our attempt to keep our kids safe and away from unnecessary trouble, we become overprotective. And we don’t realize when overprotective parenting becomes our lifestyle. It feels like a good option to always keep our kids by our side and constantly keep an eye on their activities but we need to know when to draw that line between constant supervision and underlying over-protection. For kids to strive in this world and come off their own- they need freedom. They need to be able to manage their own tasks without any adult intervention. They need to learn how to solve their own problems and deal with their environment. Does all this sound weird when thought in the context of a 2 year old? Actually not! Kids of all age need freedom. We may feel that they are too young but at each stage they need to learn certain life skills, which they can do only when they are left free to do so. To raise independent kids, we as parents should practice giving moderate freedom right from the time they are young so that they learn the skills they need to thrive and succeed in life. 1. Allow your baby to explore freely at home – Get your house baby proofed (wherever required) and allow your child to roam around freely at all the corners and spaces. Additionally, tell them about the sections where they need to be extra careful like near the gas stove or window pane. There was a phase when I restricted A&A to play only within their playpen. But I realized how frustrating it would get for them. Kids initially get excited, but once they become familiar with the place around, they learn how to explore ‘safely’. 2. Let your toddler climb the stairs by himself – I take A&A to garden everyday and there comes a stretch where they have to ascend/descend some steep stairs. To me it seemed the most dangerous thing to let my toddlers climb up/down the stairs by themselves. But I realized the more I would stop them, they would lose their enthusiasm to even try on their own. So I set a rule- I leave them alone on the stair case. They climb, jump, run and I let them be. I do stand nearby, say at an arm’s stretch but I don’t touch them till it’s truly required. 3. Leave the child alone on the swings – I usually see moms help their toddlers to climb on difficult swings. At times even accompany them on huge slides. While it’s all good to bond with the kids like that, think about it this way- if your child knows that his mom is around to catch him every time he falls, how will he learn to get up on his own? We need to let kids learn about their own abilities. I follow a simple logic- if I feel my child can’t climb alone on the swing, then that’s not meant for his age. For the ones I feel are his age, I allow him to climb alone and be on his own. 4. Give a few minutes of unsupervised play – I am not saying leave your child all alone in the garden but at home do allow an unsupervised free play time, say that of 15 mins. Let your child help himself – be it picking up his favorite book from the upper most shelf or sorting his toys. This not just helps him to be independent but also be confident of his own abilities. 5. Allow your children to choose for themselves – Give your children plenty of options and allow them to choose- be it the book they want to read or the snack they want to eat. I usually let A&A choose their clothes for the day. Of course I don’t ask them to open the almirah and pick whatever they like to wear. (I may do that, once they gain a sense of fashion and know how to mix and match). But for now, I show them two to three pair of clothing from which they can select. They get super excited and feel happy to choose what they like. As a parent the best I can do is encourage them and respect their choices. 6. Involve them in decision making – Involve your kids in some decisions of the house, especially the ones that are related to them. They feel special when their opinion is asked and they learn to express themselves. For example- ask them about the places they would like to visit while planning the weekend outing or the dish they want to eat while deciding the menu in the restaurant. 7. Let them make their own friends – Kids of all age have a sense of liking and disliking. Allow your child to choose his peer. Encourage him to be friendly and social with the kids of his age. And let him negotiate in his social circle on his own. 8. Give them responsibility- Assign them simple tasks suitable to their age- say keeping the utensils in the kitchen or throwing the waste in the bin. Raising independent kids also requires making them responsible. They need to learn how to organize their surroundings and be responsible for their own things and actions. 9. Let go off your fears as a parent– As mothers, we need to understand and trust our kids abilities. Many a times we stop our children from trying new things because of the possible dangers we assume it can involve. Till we parents learn to let go off our fears, we cannot make our kids be confident about their own abilities. 10. Know Your Child – I believe each child is different and so is his pace of development. For us parents it’s crucial to understand our children’s individual ability and temperament to know when to ‘hold on’ and when to ‘let go’. We need to gauge their level of readiness and decide accordingly. Our role as a parent is to protect our kids and also to prepare them for life. We need to give them moderate freedom to help them trust their own instincts and emerge confident. Raising independent kids is an art and we, parents have to learn how to achieve that fine balance of providing protection yet maintaining freedom for our little ones. Do you also believe in raising independent kids ? What is your take on giving freedom to the kids? Share your views in the comments below. If you like this post, pin it and share with your friends on Pinterest. 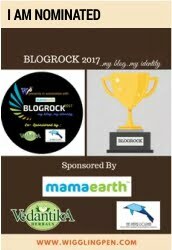 This blog post is a part of #LetsDiscussFreedom Blogathon. I would like to thank Nisha from A2ZlifeOfATwinMom for introducing me. I would now like to introduce Sunita from SunitaSaldhanaBlog and recommend you to read her views on the prompt, ‘Giving Freedom To Kids’. Also read my post ‘True Freedom is Within Us’, based on the prompt What does Freedom Mean to you. Face it! Your child has always wanted to be independent! She keeps wanting to do things on her own. So, why not tap into this nature of hers and encourage her to be an independent learner? Bang on! I completely agree with your view points on giving freedom to kids. I believe as parents it is our responsibility to ensure their safety and at the same time give them enough freedom to learn and grow up to become independent humans. These are some very simple yet useful tips on how to instill the idea of freedom among children. 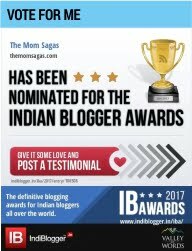 Also, wanted to know, how one can become a part of this blogathon. Please let me know. As a mom to a two-year-old, I can certainly relate! Thank you for sharing your valuable tips on raising kids to be confident and independent. You have shared some really amazing and helpful tips mommy.. being a mom of 18 month old, I myself try a few methods to make her independent and also brave and strong that even if she gets hurt she shouldn’t start crying. This also helps her in understanding that if she falls she has to get up by herself and start playing again as she is strong and independent.. Excellent points! Its so important to teach your children to feel safe playing freely at a young age, and giving them the opportunity to take risks.